Easily manage custom Customer Price Levels and Tax rates. 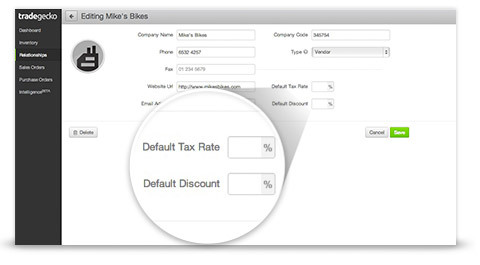 You can now set a default tax rate and default discount rates on any customer or supplier. This great new feature will allow you to set different tax codes for overseas customers according to where they are based. You can also set default discount rates for specific customers. The discounted rates will be applied across all the Sales Orders that you create for these customers.